Using the Wisconsin Health Service Areas framework and data from Wisconsin licensure records, this presentation uses information from the March 2015 AAMC Report, Complexities of Physician Supply and Demand: Projections from 2013 to 2025, to arrive at a range of possibilities for physician supply and demand in Wisconsin in 2025. The presentation explores the AAMC Report supply scenarios (including change in age of retirement, preference for shorter hours among “millenials”, and modest GME expansion) and demand scenarios (including expansion of insurance coverage, implementation of managed care, increased used of retail clinics, and increased use of physician assistants and advanced practice nurses). It concludes with a look at how the these changes may play out on the local level in terms of the need for new physician recruitment, and some suggestions for actions to mitigate the anticipated demand. A two-part presentation using Wisconsin Health Services Area geography to analyze the current distribution of the physician workforce in Wisconsin, by region and by rural or urban service area type. 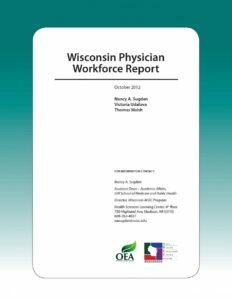 The analysis is based on data on all licensed physicians in Wisconsin as of 3-15-2012 (from Department of Safety and Professional Services) augmented by data on work setting and hours of work in patient care from the 2012 Wisconsin Physician Workforce Report (October 2012). (Spring 2015 ) Wisconsin AHEC has recently completed a project to map health service areas in Wisconsin. The primary objective for developing this service area geography is to facilitate local health workforce analysis. The service areas also provide a useful framework for monitoring local program outcomes related to health workforce development and population health status. This presentation explains how the service areas were developed and how they might be used. 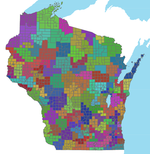 See our Wisconsin Health Service Areas page for more information (including maps, data, and files for download). In September 2010, Wisconsin AHEC, in collaboration with the Department of Workforce Development, received a State Health Care Workforce Development (SHCWD) Planning Grant. The SHCWD grant program is authorized under Section 5102 of the Affordable Care Act (P.L. 111-148) and administered by the National Center for Health Workforce Analysis, Bureau of Health Professions, Health Resources and Services Administration, DHHS. During the planning grant year, we reviewed health workforce development activities in Wisconsin to promote effective programs, and identify barriers, challenges and opportunities for investment. This review also identified federal and state policy initiatives necessary for a coherent and comprehensive health care workforce development strategy. We also worked with the Wisconsin Healthcare Workforce Data Collaborative toward consistent health workforce data collection, analysis, and labor market forecasting. With planning grant resources, we designed and implemented surveys in conjunction with professional license renewal for physicians, physician assistants and enhanced the collection of data on advanced practice nurses through the 2012 RN survey. These surveys give us a more complete picture of Wisconsin’s primary care workforce and will provide data for workforce projections.